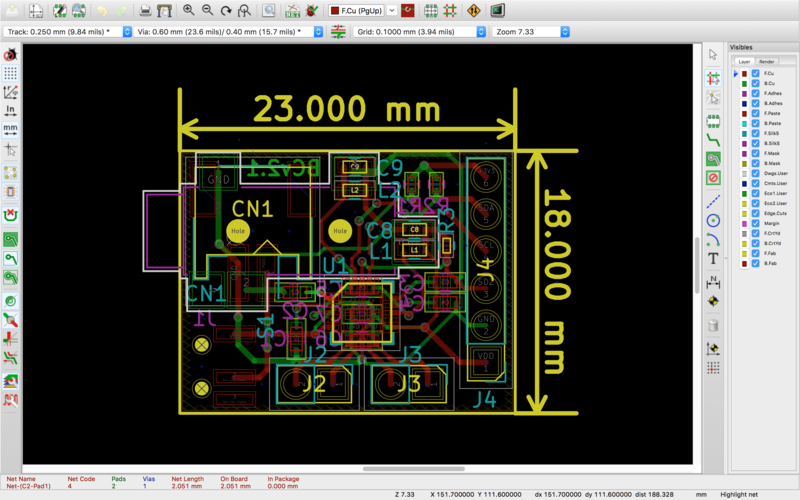 It has been six months since I started doing Schematic design and PCB Layout by myself. 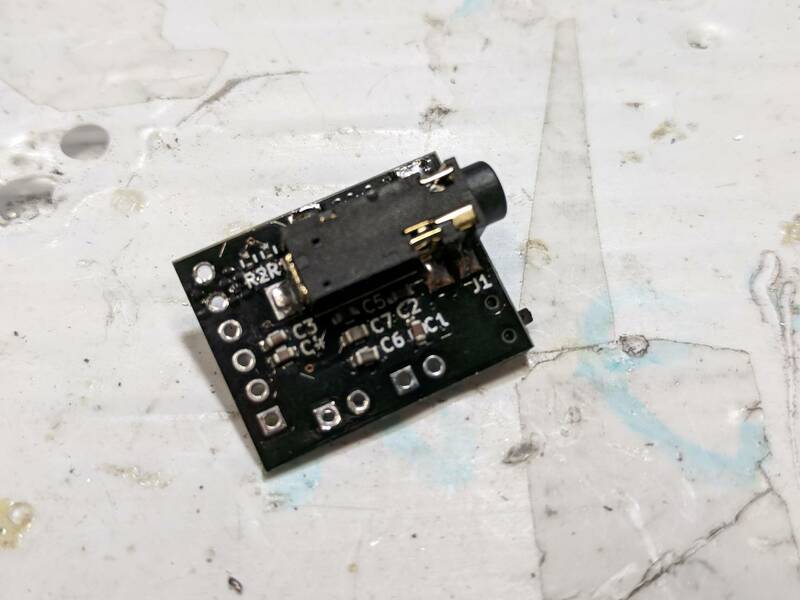 I have been working on these things for improving my engineering skills and exhibiting my prototypes in Maker Faire, especially for bone conduction devices that I am developing. I finally could make my own PCB which worked perfectly, so I will show my progress of PCBs. Do not try to design a complicated PCB for the first time. Increase the difficulty of schematic and PCB layout gradually. Know how the electronics work better than anybody else. 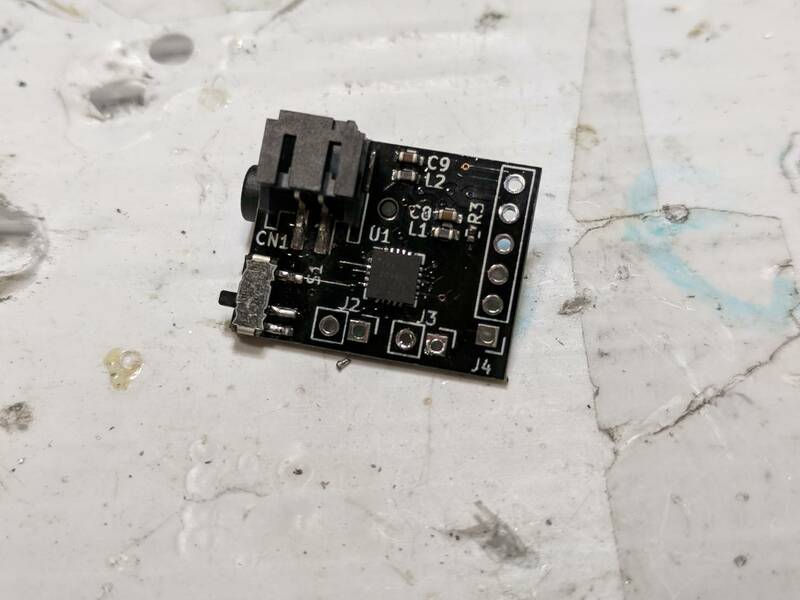 From the first failure, I design a easy PC board by eliminating a lot of functions that I was not supposed to use this experiment. 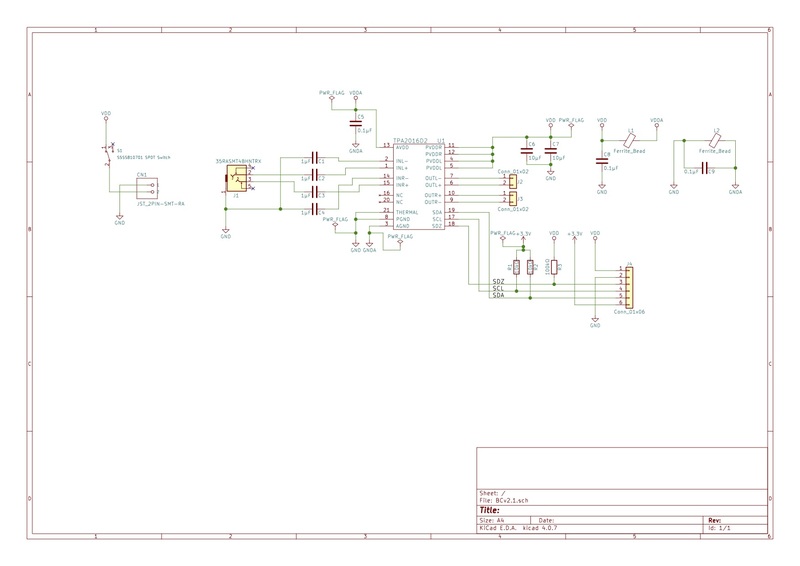 And, this is the schematic that I designed. However, this schematic also did not work because It had three errors. I did not connect Pin 21 (Thermal Pad) on an amplifier to the GND (ground). R1, R2, and R3 (resistors) were not working as pull-up resistors. INL- (Left channel negative audio input) and INR- (Right channel negative audio input) also did not connect to the GND. Make a hole on pin 21 using laser cutter and solder pin 21 to GND pin using a tiny wire. (The reason why I made a hole was the package of the amplifier was QFN and needed to be soldered using soldering cream and heat gun). Connect SDA, SCL, SDZ pins to VDD pin using three jumper wires. 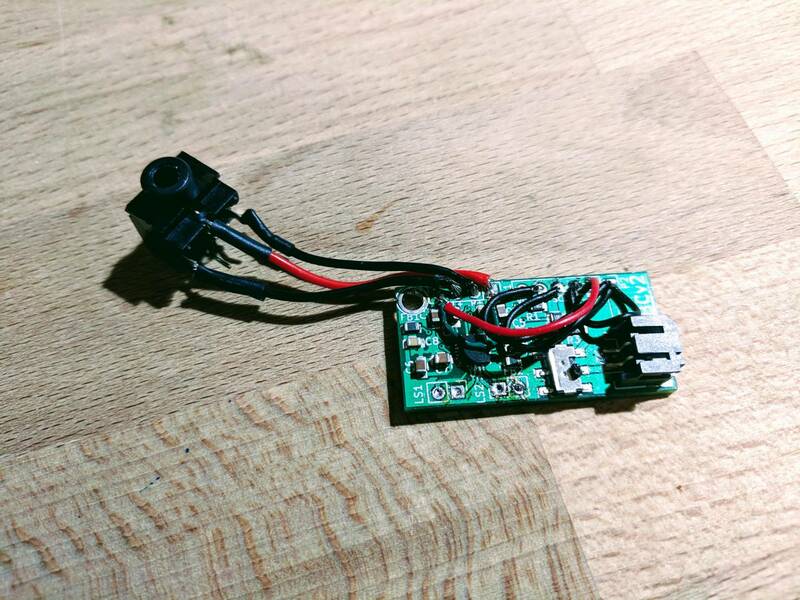 Connect INL- to GND pin using a jumper wire. After these debugging, my PCB called BCv2.0 finally worked. 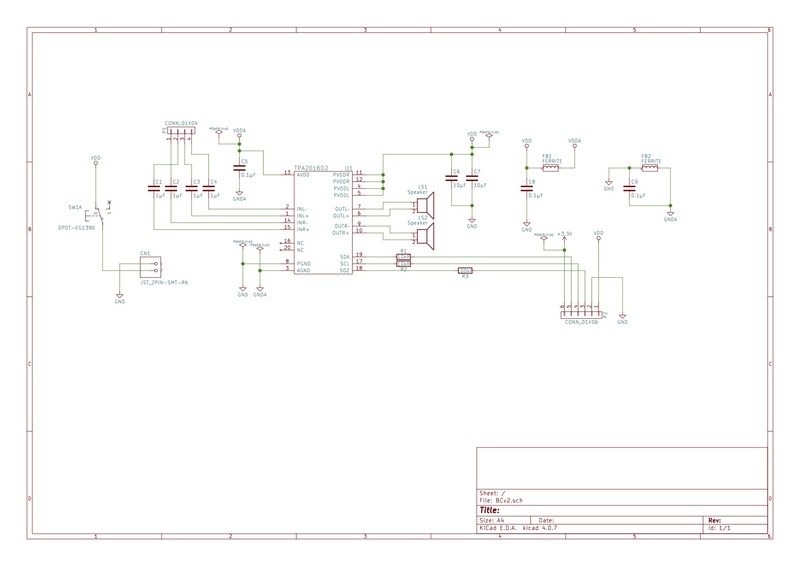 From previous failure, I redesigned the schematic. The PCB became much smaller and practical and I removed the external 3.5mm headphone jack and used SMD headphone jack. By placing components on both side, I could minimize the size a lot. 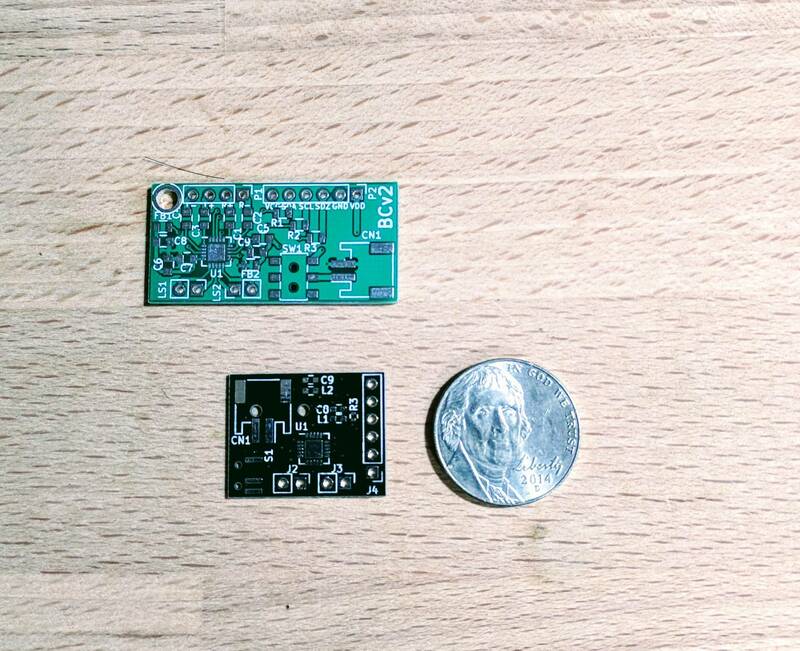 I could successfully minimize the size of PCB. This is the comparison of BCv2.0 (Green), BCv2.1 (Black), and 5 cent coin. Next challenge I will do is to put more functions such as bluetooth on my own PC Board! See you at next post!